I venture to guess that the largest number of readers were not yet born when on one sunny 6th of June, Jews as well as the rest of the free world prayed for the success of the long awaited second front that began on that day. If you are still guessing at what I am talking about, then let me explain. It was the June 6th in 1944, the 15th of Sivan 5704, now 70 years ago, which was the beginning of the end for one of the most horrendous, if not the most cruel period in the history of the Jewish people in our entire history. The following are my recollections of Operation Overlord and an account of the part that Jewish refugees played in the British Armed Forces during World War II. To download the full podcast click here. I acknowledge of course, that Jews from America and other places gave equally valuable service, but I confine myself here to the British Army, to which my knowledge mainly extents. 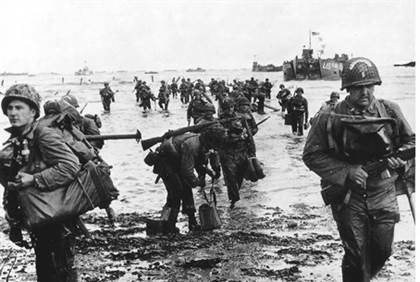 No one knew that Operation Overlord - the invasion of Europe by British and American troops that began on the coast of Northern France in Normandy on that day, commonly known as D-Day - would bring to light what was later correctly described as the Holocaust of six million Jews, along with millions of other innocents. Even before that date, my unit was already confined in a large London park, where we were briefed on the mission which we were about to take part. This information included the terrain we were to encounter and more. Hence, we were kept under guard so that this information would not reach the outside world, in what was referred to as a "concentration camp" in the very literal sense, where the only way out was in convoy to the port of embarkation. It was ten days into the operation that I drove my light Humber Ambulance to the port of Harwich and embarked onto one of those Liberty ships, mass-produced in the U.S., to sail to Normandy in north-western France. By that time, already some elements of Mulberry Harbour as it was then called, large floating obstructions to serve as breakwaters were towed across from England and had reached the French coast, to facilitate the unloading of ships onto the beaches. Transferred from the ship onto landing barges, I made it onto the beach. Paths to the interior which were secured earlier were marked by tapes to be free of mines. My unit was facing fanatical SS troops and some Hitler-youth who would not come out of their dugouts despite loudspeaker warning. Our tanks had to run over them. We eventually crossed the Odon, a small river and came to halt before the Orne, the large river in the area. The battle that became known as one of the fiercest of the early days of the invasion was about to begin on July 10th. The battle of Hill 112 took place on the highest point between the rivers Odon and Orne in an effort to capture Caen, the main city of Normandy. During that period, I saw the first 1,000 bomber raids on Caen. It was an awesome sight as well as sound. There was a great contribution of those Jewish men and women of an older generation, who fled to England from Hitlerite oppression to joined the British Army already in the early war years. As they were mainly German and Austrian nationals, if they were captured, they would be shot without further question. That was the risk they undertook and they were requested to sign a declaration declaring they understood the situation. 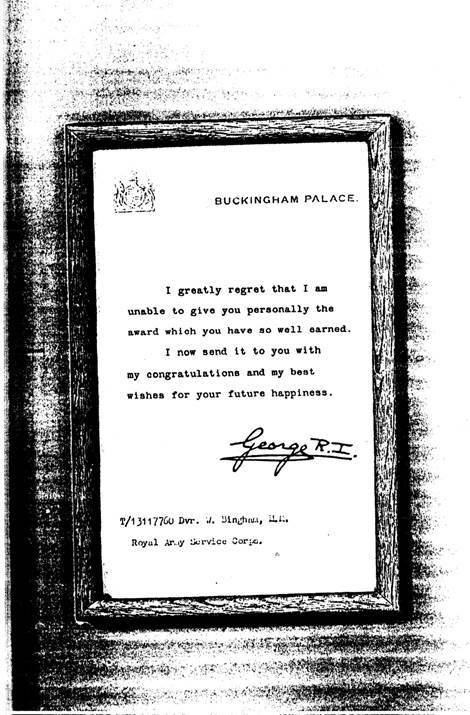 "I hereby certify, that I understand the risks to which I and my relatives may be exposed by my employment in the British Army outside the United Kingdom. Notwithstanding this, I certify that I am willing to be employed in any theatre of war." To sign this was already a brave act before even having donned a uniform. It was in the very early years of the war, when thousands were held in camps set up for enemy aliens. They wanted to get out and volunteer for army service to fight the Nazis. Eventually, more than 6,000 of these men were released to join the British Army. At first, they were only allowed to become members of the Auxiliary Military Pioneer Corps. They became the Army's handmaidens - teacher was turned into bricklayer, merchant banker into carpenter, and philosopher into general laborer - as they were not trusted with arms. Their early training was with spades and broomsticks instead of rifles. Having completed their training, they were dispersed all over England, to different jobs where their skill and training could be put to use. Some were distinguished engineers and architects. This enabled them to carry out difficult and important work and initiate improvements. But these refugee soldiers were not satisfied. They wanted the chance to fight, and at last in 1943, were accepted when a call came for volunteers. At first it was only for the most dangerous jobs, then the commandos, the parachute regiments and later for the rest of the units including intelligence. At Anzio and in Normandy, on the Rhine and in the south of France, they were the Army's pathfinders, familiar with the terrain since childhood and fluent linguists. Those who were accepted as volunteers had a deep conviction of the cause for which they fought. They went into enemy country in British uniform or as civilians, knowing that if they were captured they would be executed as spies and traitors. Not to mention what would have happened to them had they been discovered to be Jews. They won promotion and hundreds of them became officers, many leading British troops into action. In the Intelligence Corps, officers from Berlin and Hamburg planned moves which enabled their colleagues from Vienna and Cologne to catch criminals. Later they became interpreters as well as fighters. In the early post war administration of Germany and Austria, the Control Commission, the former bricklayers took leading parts as interpreters at the Nuremberg War Crimes Trials, in legal departments and broadcasting through the critical days. As the war progressed many more young refugees who lived in England became of military age and successively joined the British Armed forces. Then there is the story of the many refugees from Germany and Austria and Central Europe who joined the British Forces in the land of Israel. In 1944 they formed part of the Jewish Brigade group and fought in Italy. After the war, many of them helped Holocaust survivors reach Israel. Several thousand remained in the service until the end of 1947, including yours truly. 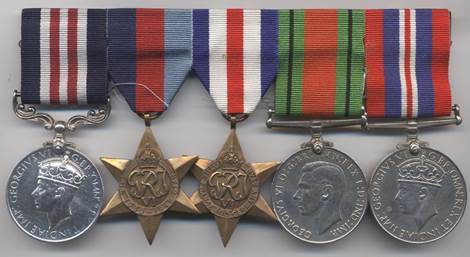 I was fortunate that some of my exploits on active service were officially recognized with the award of the Military Medal for Bravery in the Field. The bravery of many others remained unobserved, and several hundred Jewish refugees to England gave their lives so that we can live in relative peace. Several rabbis were commissioned as officers to minister to the Jewish soldiers. I treasure the military siddur, the prayer book with which I was issued. It was not only our men who served in the British Armed Forces. I would be remiss if I would not mention the many Jewish refugee women from enemy countries who volunteered their services. But it was not until the end of 1940 that the Women's Auxiliary Territorial Service of the Army (ATS) was opened to them - and then only as cooks, orderlies and storekeepers. By that time, a large proportion of refugee women had been absorbed in war industries and they felt that they could carry out a more useful service to the country in that activity than in menial chores for the forces - for example by manning radar stations - but these openings were long denied. The friendly aliens of enemy origin such as Jews who although born and brought up in an enemy country like Germany but arrived with a passport issued by a neutral or allied country, could enter any category of service. They were also not initially interned like German and Austrian Jews. It was ironic that the color of the passport determined our fate and not the fact that we were all Jewish refugees from the Nazis. Even I, because I came with a Polish passport and had a different sticker on my alien registration book, was classed as a friendly alien and not interned, as many of my friends who arrived together with me in England but who had German passports were. The Austrian passport of my late wife, may her memory be for a blessing, caused her to be interned on the Isle of Man as an enemy alien for 18 months. The main intake into the ATS was from women of military age, who were interned at the Isle of Man and who were release like the men into Military service. One woman wanted to be a nurse for which she was qualified, but remained a cook for more than four years. After 1943 other branches became open to the women, except signals. They apparently did not yet fully trust their loyalty. Some were detached to the foreign service of the BBC, others were admitted into the Army Education Corps. Cases of husband and wife, brother and sister or father and daughter serving together in the forces were not rare. Many cases are documented. Alien women of the Woman's Auxiliary Air Force, (WAAFS) played a significant part in the Y services, a form of psychological warfare which included the transmission of false orders to pilots of enemy aircraft. When the German Luftwaffe realized that it was the ghost voices of the Royal Air Force (RAF) creating havoc in their organization of air raids, they employed women to transmit orders to their aircraft; but the Royal Air Force defeated that German measure by using our refugee women to send misleading signals in German. The linguistic talent of the enemy alien Jewish women was recognized and gradually the barriers were taken down and the Jewish women like men could serve together with British women. I have records of the many extraordinary brave exploits of Jewish refugees from Germany and Austria that would take several articles to relate. We can be proud of these Jewish men and women and their dedication in the war to defeat the greatest evil of modern times. Today, the 6th of June, the date of the invasion of Europe in 1944 is being commemorated on the battlefields of Normandy. Some of those aging veterans of that great event who were able to make the journey have traveled there to take part and remember their youth and their comrades who never returned. Others are there in thought. Similar to religious Jews who wear their tzitzit - those fringes on the garment as a visible reminder that they are Jews - so too in a similar fashion, but with different thoughts, I have today donned my beret and my medals to commemorate the 70th year since D Day. All that was indeed an important part of my world. Walter Bingham is the host of Walter's World on Arutz Sheva - Israel National Radio. Topics range from cultural and entertainment events and social problems to major political interviews and statements recorded live as they happen. His guests have included Alan Dershowitz, Chief Rabbi Lord Sacks, Charles Krauthammer, John Bolton, German film star Iris Berben, Jewish community heads of many countries, singing and entertainment stars Dudu Fisher, Yaffa Yarkoni, Theodor Bikel, David D'Or as well as many politicians, political commentators and academics. For podcast archives, click here. Ben Bresky contributed to this article.